Priests would then take this new fire back to their temples and relight the altar fires which had been extinguished five days before. The citizenry would then come to the temple to obtain this fire to relight their own hearth fires which also had been extinguished five days prior. 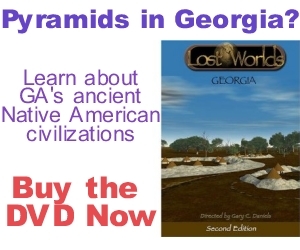 (Early colonists noted how tribes throughout Georgia and the southeast practiced a similar “New Fire” ceremony– minus the human sacrifice.) 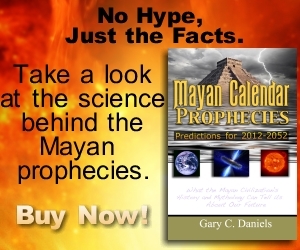 The Aztecs tracked this 52 year cycle via the famous Aztec Calendar Stone (or Sun Stone.) Could this 52 year calendar cycle have originated because of the 52 years of calamities caused by the comet impact of 536 AD? 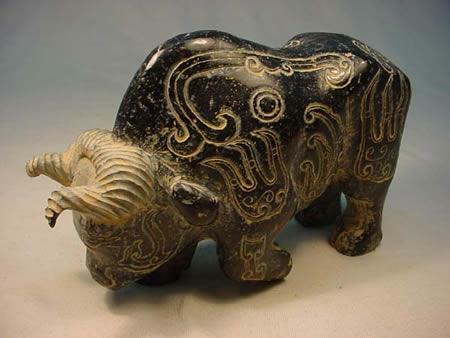 This jade ox/bull shows fireballs, possibly fragments of a comet, emanating from the Pleiades star group, represented by the concentric circles, in the constellation Taurus, represented by the ox itself. Coincidentally, a Chinese jade from this time period (Tang Dynasty, 600 AD) was sculpted in the form of an ox or bull and has multiple fireballs emanating from the shoulder and body of the bull. The bull has concentric circles on its shoulder in precisely the location where the Pleiades star cluster sits in the Taurus constellation. The Pleiades star cluster is located on the shoulder of the constellation Taurus thus this jade ox very likely represents the constellation Taurus and the concentric circles on its shoulder represents the Pleiades star cluster. If the fireballs that caused this 52 year period of droughts and plagues originated from the Pleiades star cluster, as this jade sculpture indicates, this would help to explain the great fear Mesoamerican cultures associated with this star group. 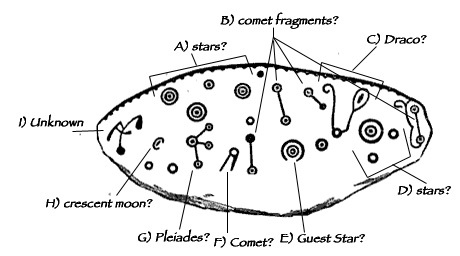 In 1940, astronomer Fred Whipple discovered that the yearly Taurid meteor shower which appears to emanate from the Pleiades was made of fragments from Comet Encke. In 1950 he also discovered that the orbits of three Taurid meteors coincided with each other but not with the orbit of Comet Encke concluding that they were formed by a breakup 1500 years ago of a fragment that had in turn broken off from Comet Encke much earlier (around 4700 years ago.) 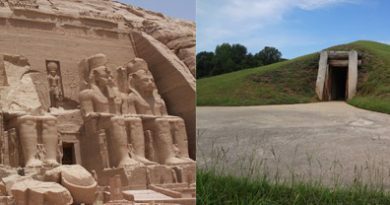 In other words, around 2700 BC a large fragment broke off of Comet Encke and then around 500 AD this large fragment further disintegrated leaving three large meteors. The timing of this breakup places it in the right time-frame to be responsible for the impacts which caused the climate event of 536 A.D. Coincidentally, the Chinese jade above shows three large fireballs emanating from the Pleiades which may depict this event. 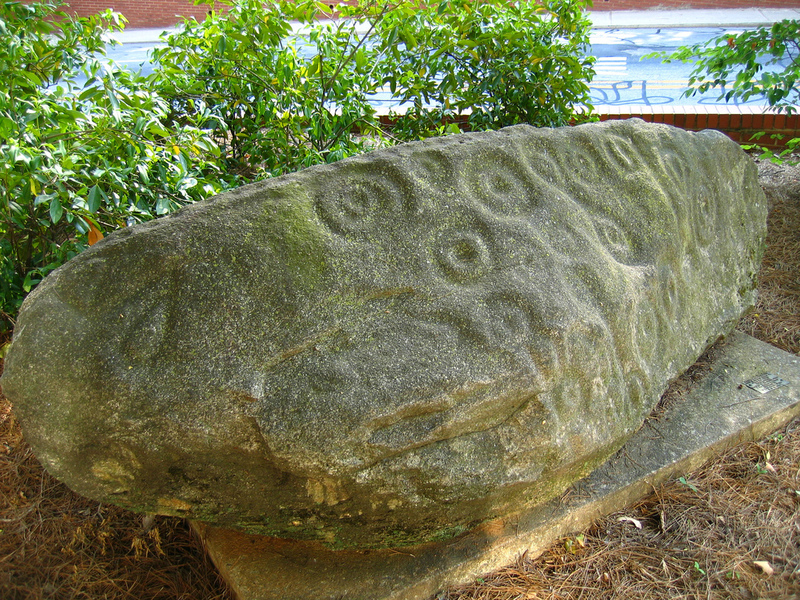 Hopewell shell mask showing concentric circles as eyes and “fireballs” or “weeping eye motif” surrounding the eyes. 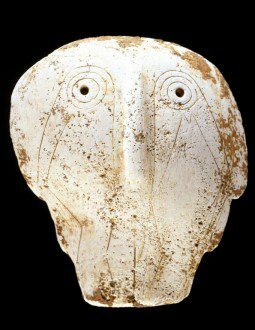 Interestingly, Native Americans in Ohio’s Hopewell culture, which had trade contacts with the Kolomoki culture, created shell masks which featured a design element known as the “weeping eye” or “forked eye” motif that is very similar in design to the fireballs on the Chinese jade ox. 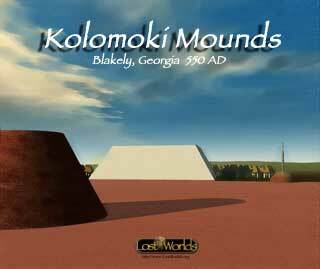 Could these Hopewell artifacts have been documenting the same cosmic catastrophe? 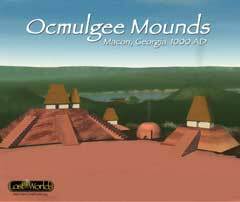 This design motif would disappear for centuries only to reappear at the next site in our story, Ocmulgee Mounds, one year after Chinese records recorded one of the brightest and largest comets in history. Was this a coincidence or did the appearance of such a bright comet revive the ancient memories of a previous comet that split into fireballs and devastated Earth’s climate? 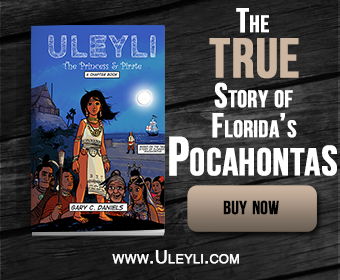 Researchers date the end of the Hopewell tradition to around 500 AD thus making it a likely victim of this same catastrophe. 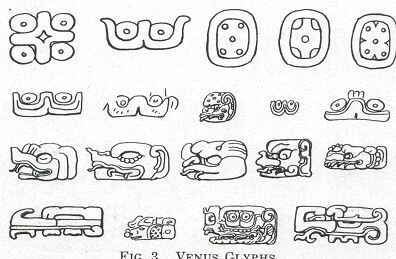 Mayan Glyphs on Georgia, Florida Pottery?